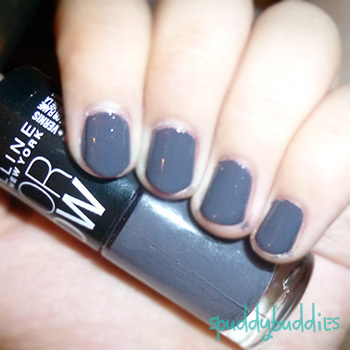 You can never have too many grays in your nail polish collection. Or so I like to think. Which is why when I stood in front of the Maybelline Color Show nail polish shelf and I couldn't decide on ONE polish, I finally picked Impeccable Greys. I remembered seeing a nice swatch of this color anyway. The name is brilliant - love it. The bottle is cute but I'm not sure I like gripping cylindrical bottles... I prefer to have some kind of grip - think Orly nail polish bottles. I used 2 coats because the first coat was slightly streaky. Overall, this polish is a keeper but what I can't stand is the brush! It's such a flimsy, skinny brush that doesn't quite spread the polish as nicely as I would like. You can probably tell from the messy cuticles... and I managed to get polish all over my skin hurhur. I would definitely buy more polish from Maybelline but I hope that they'll make the brush flatter and rounder. What do you think? Do you have Maybelline polishes? Like or hate the brush?